1Lt Robert Blumenthal (N) - 30 missions #184 6/19/44 to #248 9/28/44. 25 missions with Wilson Crew. 5 missions with other Pilots. Became a Lead Crew Navigator. T/Sgt William J. Kuczewski (E) - Not on original assigned crew but probably in crew photo. 33 missions #14 14/25/44 to #196 7/5/44. Wilson Crew Engineer on 9 missions. Substitute Engineers used on other Wilson Crew missions. 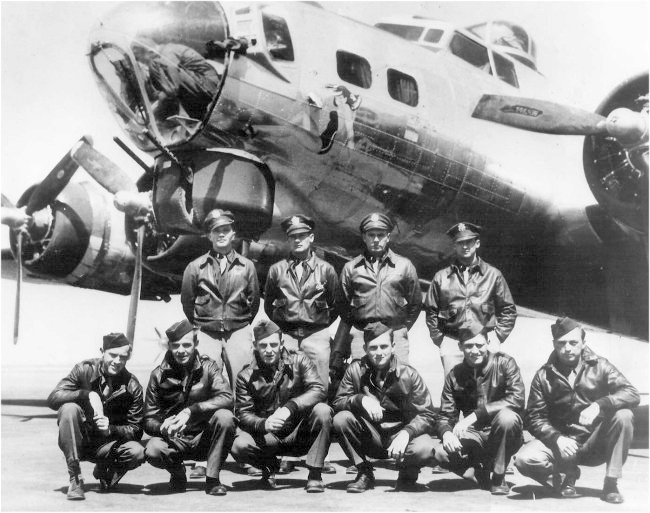 Flew 24 missions with other Pilots including: James W. Bowen Crew - 3 missions; Edgar C. Miller Crew - 4 missions; 11 missions with Max A. Christian Crew; 3 missions with Earl N. Thomas Crew; 3 missions with other pilots. S/Sgt Donald G. Case (BTG) - 30 missions #184 6/19/44 to #271 11/10/44. With Wilson Crew on 25 missions and 5 missions with other pilots. Sgt John H. Roberts, Jr. (WG) - Original crewmen. Deleted from crew before crew's first mission when crew size changed from 10 to 9 men. Flew no 303rd BG(H) missions.